Once again I'm thankful to Amazon's "100 Books" list for recommendations of books I would otherwise have missed. 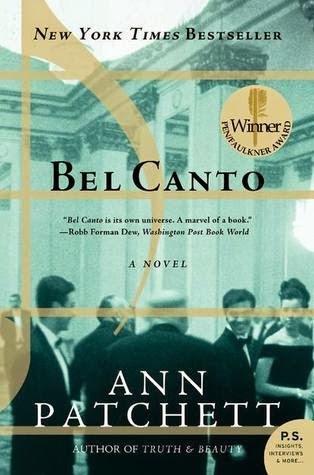 Patchett's Bel Canto is described as "a literary page turner", and it certainly lives up to the description, but is so much more. To me, reading Bel Canto was "comforting". I enjoyed reading this novel because it made me feel calm. Does that make sense? Probably not, when we consider the subject matter contemplates the experiences of a hostage situation, but the way the story is brought out expresses such beauty in words and the invocation of our imagination. I knew from very early on what would be the inevitable conclusion of the tale. It is actually written in the early pages, though you'd be forgiven for missing this line amidst the descriptions of love and beauty with which it is surrounded. Despite this, and despite the most unlikely scenarios and coming-together of characters which ensued, I couldn't help but become absorbed, and to hope. Much like the character's hopes and dreams, of which I was reading. Truth be told, my preference would have been to give Bel Canto four and a half stars. It's not quite perfect, but it comes very close. It is beautiful, thrilling, moving and enjoyable. I hope that in my lifetime I might find another story which makes me feel the same way - comforted and absorbed - with the same magic as this has touched me.